Lots of people in my family call me ‘Mouse’. Parties! I am also not very keen on snakes, but I think I prefer them to parties. Like a quiet friend chatting with you on the train. I would love to be Lucy from C.S. Lewis’s The Lion, the Witch and the Wardrobe. She gets to meet MrTumnus, Aslan AND Father Christmas and she is the first to find the snow and the pine trees at the back of the wardrobe. I think she is the luckiest book character I know! I’d quite like to have been a Viking woman, perhaps around the year 1000? I don’t think I would have liked the food very much, but I would love to learn their style of weaving and listen to their music and see the beautiful ships being built. I can’t believe you still get to write stories, but now you get to call it a job! But now that you have a home of your own, why isn’t there a room full of nothing but huge cushions for you to run around and jump on? I thought that was the plan! My Granny. She was just the right mix of sensibleness and magic, which is how I would like to be myself. I’m not sure, but I think it might have been reading Enid Blyton. I read so many of her stories that I think they snuck into my mind and made me want to try writing by own very early in my life. I also had some very nice teachers along the way including one in high school, Mrs Wong, who encouraged me and really helped me to develop my writing style. 11. What is yourfavourite word and why? Gazebo. There is no word in the English language that is more fun to say than gazebo. It would be Wind in the Willows by Kenneth Grahame. I go back to it whenever I’m feeling a bit down or a bit unwell. The characters feel like old friends and their homes like places I’ve lived myself, except unlike real friends and homes, they don’t change or even get older. They’re always just as I remembered. Anna Branford is an award-winning author as well as being a dollmaker and sociology lecturer at Victoria University. She is the author of the popular Violet Mackerel junior fiction series. 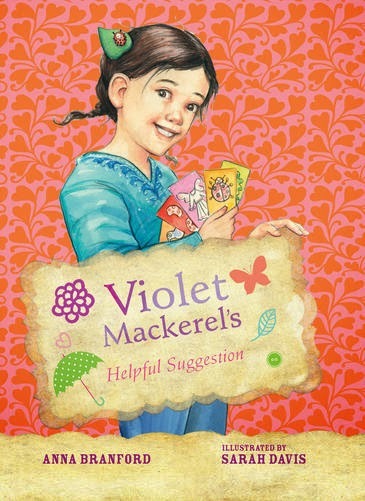 Her latest book, Violet Mackerel's Helpful Suggestion (KBR review), was published by Walker Books in June 2014. Visit Anna's website to find out more about her books and writing.